Patna, April 2: It is a battle of Manjhi versus Manjhi in Gaya parliamentary constituency. In a direct contest, the ruling NDA and the opposition Grand Alliance (Mahagathbandhan) have fielded candidates belonging to the Mushahar Dalit community, considered among the most deprived and marginalised sections of society. For the first time in three decades, the BJP candidate is not contesting the polls as the seat went to its ally JD-U this time under the seat-sharing formula. The reserved constituency of Gaya is considered the stronghold of the BJP. The party has won the seat four times in the last 20 years - in 1998, 1999, 2009 and 2014. 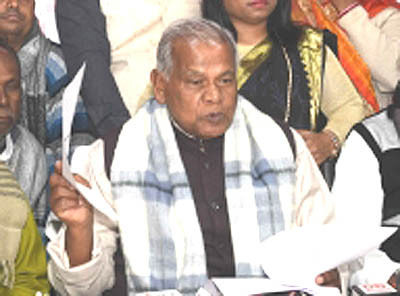 With the Gaya seat going to the polls in the first of seven polling phases, the Hindustani Awam Morcha (HAM) chief and former Bihar Chief Minister Jitan Ram Manjhi is Grand Alliance candidate pitted against NDA candidate Vijay Manjhi of the JD-U. Since 1999, only candidates of the Musahar community, that derives its name from the practice of eating rats after usually hunting for them in paddy fields, have won the seat in successive elections. In last two polls, BJP's Hari Manjhi defeated RJD's Ramji Manjhi. Though there are nearly a dozen candidates are in fray, the stakes are high for Jitan Ram Manjhi. In his early 70s, if Manjhi wins here, he will become an MP for the first time in his four-decade old political career. He had unsuccessfully contested the polls in the past. The BJP, which is supporting its ally JD-U instead of contesting itself, has angered local party leaders and workers, who wanted party to contest polls. Sitting BJP MP Hari Manjhi is reportedly not happy after the party denied him the ticket to favour their ally. There is widespread speculation over whether Jitan Ram Manjhi can break the BJP stronghold, or whether he will meet the same fate as in past. That it will not be easy for JD-U's Vijay Manjhi either, seems the dominant view among people in Gaya, a pilgrim and tourist destination. Scarcity of drinking water during summer is a serious problem both in rural and urban areas of drought-hit Gaya district due to depletion of ground water as a result of over-exploitation for irrigation and drinking. Besides, unemployment is another issue, as despite being a tourist centre, development has lagged behind and people have been forced to migrate outside the state for their livelihood. Vijay Manjhi is hopeful of getting the upper castes votes considered the traditional support base of its ally, the BJP, alongwith votes of the Other Backwward Classes (OBCs), the Economic Backward Classes (EBCc) and other Dalit communities. "We are sure to get the support of the OBCs, EBCs, Dalits and Muslims. Only EBCs and Dalits together make up over 35 per cent of the electorate. Apart from upper castes, if the party manages the support of Muslims, our candidate will be comfortable" JD-U leader Neeraj Kumar said. Jitan Ram Manjhi is confident of getting overwhelming support from RJD's traditional social support base of Muslims and Yadavs, as well as the similar support base of allies like Congress and RLSP among the Koeri other castes. "Our leader Jitan Ram Manjhi is a popular face in Gaya, his home town. He enjoys support of all castes and communities, unlike our rivals," HAM party leader Danish Ruzwan said. The total number of voters in Gaya constituency are 1,329,192, consisting of 705,874 male 623,318 women. The constituency has 6 assembly segments. In the 2015 Bihar Assembly polls, the RJD won 3 seats and one seat was won by its ally Congress. The BJP and JD-U won one seat each.